Researchers at the NC State College of Veterinary Medicine have successfully isolated and recreated the innermost layer of a horse’s intestine using stem cells. They’re called “mini guts,” and they are a leap forward in the study and prevention of devastating intestinal diseases in horses. 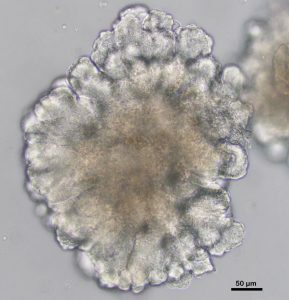 Researchers at the NC State College of Veterinary Medicine have successfully isolated and recreated the innermost layer of a horse’s intestine using stem cells. All the intricate nooks and crannies of intestinal cells can be seen in the 3-D structures, a true out-of-the-body representation of what’s going on deep inside the intestine of an animal. It is the most complex, complete 3-D replication of equine intestinal cells created to date. The work will allow equine researchers to not only better understand the precise mechanisms behind tissue damage but also find the most effective ways to treat gastrointestinal diseases such as colic, the leading cause of death for horses between the ages of 1 and 20. The mini guts, or enteroids, could also one day lead to effective therapies for the estimated 60-70 million Americans a year who suffer from a range of intestinal disorders — all by mastering the regenerative capabilities of intestinal stem cells. The first author of the study, published by the Equine Veterinary Journal, is Amy Stieler Stewart, a current Ph.D candidate in lab of Liara Gonzalez, CVM assistant professor of gastroenterology and equine surgery. Gonzalez is the corresponding author on the study, with research specialist John Freund as co-author. “This opens up so many opportunities with regard to potential treatment options,” said Gonzalez. “We’re now only limited by our imagination. 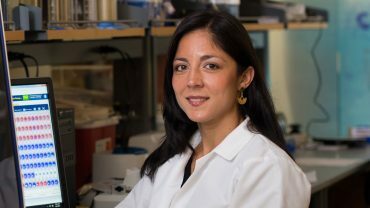 During her Ph.D. studies at the CVM, Gonzalez was the first to develop a large animal porcine model for the study of intestinal stem cells for translational gastroenterological research. The new equine intestinal study uses similar techniques Gonzalez developed just a few years earlier when working with pig stem cells. 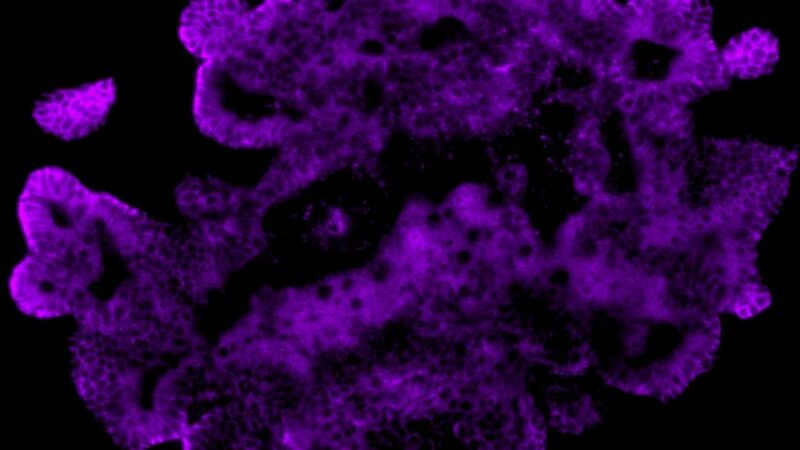 For the new study, tissue layers rich in intestinal stem cells, called crypts, were isolated and successfully nurtured in a dish. That resulted in complex budding structures consisting of detectable stem cells and all of the many cell types that normally exist in the innermost layer of a horse’s intestinal tissue, or epithelium. Another breakthrough from the research: The team was able to freeze the crypts, store them for multiple days and then thaw out still-viable stem cells. Potentially, that can lead to a bank of intestinal stem cells, a reserve of treatment solutions targeting specific injuries. “If we are able to come up with a new therapy or a new treatment, we would just have to go to the freezer,” said Gonzalez. The work is just beginning. The freezer-storage element of the research is the subject of a forthcoming study from the team. Next is exploring the clinical applications. The crypts can be used to test epithelial resistance to different types of injuries, providing an up-close view of how cells talk to each other, change and move. Using the mini guts, researchers could find a drug that stimulates the epithelium, making it regenerate faster and more effectively, said Gonzalez. Through funding from Kemin, an animal and human nutritional health ingredient company, the team will study the impact of hypoxic injury, or loss of oxygen, on the intestinal stem cells. Gonzalez’ original research with pig intestinal stem cells was funded by the National Institutes of Health. “My goal as a clinician is to streamline this to the clinic floor as quickly as possible,” said Gonzalez. Though intestinal stem cell research is relatively new compared to orthopedic-related mesenchymal stem cell work, NC State is already at the forefront of the field. It’s part of the CVM’s large dedication, especially in the field of equine health, to using stem cell research as a direct path toward improving human health. Ongoing CVM research includes looking at how stem cells could treat equine musculoskeletal injuries, as well as the development of synthetic versions of cardiac stem cells to repair damaged heart tissue. Though veterinarians have gotten better at surgical interventions, there have not been any new, major breakthroughs in treating colic for years, said Gonzalez. As a resident, Gonzalez was frustrated by colic cases, which are often emotionally taxing for horse owners and the clinicians working on the cases. Horses could come in to the hospital with nearly identical clinical signs and be treated with the same therapies, only to result in extremely unpredictable results. Now, Gonzalez said, there is a strong potential to make a big difference in equine medicine.